A new survey shows that foreign tourists are staying in Seoul for five or six days on average per visit. 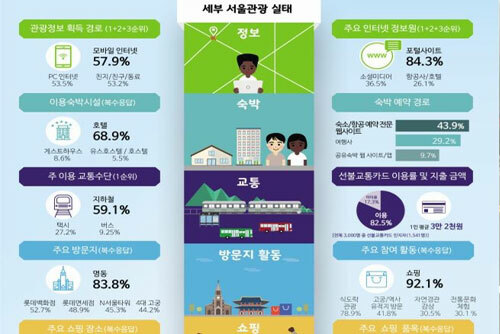 The Seoul City Government on Wednesday announced the result of a survey conducted together with the Seoul Tourism Organization on three-thousand foreign tourists who visited the capital city in the first half of the year. The respondents said they stayed in Seoul for an average of five-point-66 days. Just over 55 percent visited the city for leisure, recreation and rest purposes. More than 80 percent said they visited Myeongdong in central Seoul, while around 92 percent said they took to Seoul’s streets for shopping and around 79 percent did so to try Korean cuisine. Among the polled, 48-point-six percent said they were in Seoul for the second time or more, a rise of six-point-one percentage points from the same period last year. Nearly 90 percent said they would visit Seoul again. Next :Special Counsel to Question South Gyeongsang Gov. For Second Time Thurs.